Contrary to what many Mac users believe, regular cleaning/maintenance of your computer is a necessary ritual, just like it is for the Windows users. Why? You might ask… The reason is: As you continue using your Mac, it tends to accumulate loads and loads of junk. This results from the developer files, uploading and downloading of music and video files, iPhoto images, language support files, to name but a few. Needless to mention, these junks will occupy significant disk space and slow down your computer performance. Luckily, you can use the CleanMyMac apps to help you clean this junk and keep your Mac running at its best at all times. In the following CleanMyMac review, we take a closer look at what this App entails and how it’s cleaning effectiveness. PS: In the entire post, we’ll focus on the latest app version- CleanMyMac X. Designed by MacPaw, CleanMyMac is an extremely easy to use utility intended for all Mac OS versions. It helps you efficiently clean your Mac (in terms of speed and storage) by wiping away gigabytes of junk that have accumulated on your computer after using it for a while. So, if you suspect that your Mac has been running slowly of late, or indicates it’s running low on memory, the first thing you’d want to do is install this amazing app. It’ll give you details regarding the status of your hard disk, processor, RAM, and even battery health. Unlike other cleaners that come with only the cleaning up feature, this unique app comes with additional maintenance functions such as Uninstaller, Shredder, among others. I’ve used a thousand and one apps in my life…and honestly, not many of them compare to this app’s user interface. I mean, it comes with such as an exquisite, straightforward, and easy to use interface that will truly appeal to your eyes. Besides the sleek interface, the whole navigation process has been made easy- with each function coming with a simple explanation of what it does. This allows you to quickly determine which function you need to click to execute what task. Adding to the ease of use of this app is high-quality graphics it comes designed with. As I did hint you earlier, CleanMyMac comes with a long list of features- both cleaning and maintenance/utility- to ensure your Mac receive the utmost care that will enable it to reach its peak performance. Smart Cleanup: This is the very first feature you’ll get on the app’s dashboard. It presents you with a “Scan” button that automatically analyses and cleans your Mac. Speaking from experience, Smart Cleanup is quite efficient and will clean a huge number of junk files- up to 4 GB! System Junk: It cleans up the vacant language files, unimportant localizations, old records, damaged app data, unwanted cache files, among other things. Photo Junk: Don’t underestimate the power of this feature! Every time I run it on my Mac, it quickly identifies and removes all the duplicate as well as unwanted photos. Mail Attachments: If you want to view all the attachments in your mail that you’ve received or sent up to date, you simply need to click the Mail Attachments. You’ll be surprised by the huge space they might be occupying. NOTE: Make sure you’ve got a backup for these files. iTunes Junk: As the name implies, this one clears all the iTunes junk. I also used to ask myself this question, until I discovered that all the iTunes downloads I canceled remained in the iTunes memory. Clean them today and see the difference on your Mac performance and speed. Trash Bins: There’s no better way to check the trash contained in all your mac folders and deleting them permanently than using the Trash Bins feature. Large and Old Files: This is among my best features that come with CleanMyMac X. It lets me easily identify the files consuming large spaces on my computer. Plus it also points out the files that I haven’t used for a long time. Trust me; deleting such files will magically improve your Mac’s overall performance. Uninstaller: With this feature, you can easily uninstall all the apps that you don’t need. And keep in mind that it gets rid of all the data related to each app you uninstall, unlike other similar programs. Maintenance: Another one of my favorites! The Maintenance utility feature simply handles the job intended for the Apple’s Disk Utility much easier and faster. It verifies your startup disk and sets up your disk permissions. It will also perform a handful of other disk maintenance tasks. Privacy: Data security is one of the top concerns of today’s world. Luckily, the Privacy feature that comes with CleanMyMac X deletes all the data that might lead to a security breach if someone gets access to it. These include browsing data, saved passwords, cookies, attachments, message history, download history, auto-fill data, etc. Extensions: Thanks to this feature, you can easily find all the add-ons on your browser or apps…and helps you disable your login items, widgets, or applications. You’ll be surprised by the many add-ons on your browser that you don’t need. And of, course, removing them have a positive impact on your computer speed! Shredder: I call this a “Magical Tool” because it quickly removes all your unwanted folders, without lacing a single dash. What’s more- the tool goes ahead and permanently deletes all these folders such that they’ll never be discovered again. So, be careful of what you wish to shred with this tool. Incredibly easy to navigate interface. Privacy feature will cover your tracks. Uninstaller feature gets rid of the remaining parts of any application you uninstall. The smart cleanup function starts cleaning your mac with the click of a button. The free trial comes with 500MB cleaning limitation. The high number of alerts it sends you might annoy you. First, head to the MacPaw official website and download CleanMyMac X software (from CleanMyMac X page). You’ll obtain a .dmg file which you’ll need to drag to the Applications folder to automatically initiate the installation process. When the installation is over, open your CleanMyMac App via the Apps folder. You can also search for it in the Spotlight. Click on the Activate button at the upper right corner of the dashboard. Select Buy License. You’ll be directed to the official site where you’ll make a payment and an activation number will be emailed to you. Go back to your app’s interface and enter your activation number to activate it. After successful activation, you’re now ready to enjoy all the remarkable features and functions that come with this amazing app! I’m 100% satisfied with CleanMyMac’s ability to clean my Mac, remove all the junk files, and give it a performance boost. And while saying this, I’m aware of users who have express dissatisfaction with the same software. But I have an explanation for this. The problem might not be the app; it might be your Mac. We’re all using different Mac. Yours might be new and no junk has accumulated yet. You might be using an old Mac and installing this app will remove all the junk that has been hiding in it, and you’ll experience the difference in performance and speed. Sometimes, cleaning up might not solve the underlying issue. For instance, we know that there are many factors that might lead to slow running of your Mac. Bottom line: If you run CleanMyMac and it doesn’t solve the issue with your Mac, try looking for any other issues that might be affecting it. As you already know, CleanMyMac X allows you to try it out before you can buy it. The trial is 100% FREE to use- but keep in mind that it limits you to cleaning only 500MB files. Thankfully, you can remove this limitation by buying a license. Before I show you how to buy the license, it’s important to understand that MacPaw has a rather different pricing model- where they charge a one-time fee. 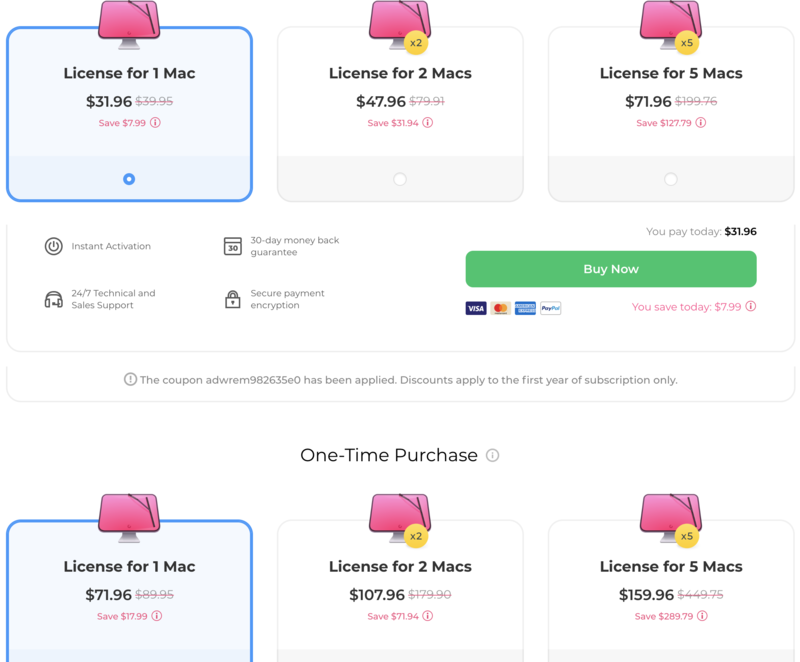 You’re required to buy your license based on the number of Mac users: If you wish you can use our CleanMyMac Discount Code to reduce the price as well. NOTE: MacPaw also offers you a 30-day money back guarantee. This means that if you’re not satisfied with your CleanMyMac app, you can ask for a total refund of your cash within 30 days of purchase. To do this, I suggest that you call them and drop them a mail as well. They’ll surely refund your cash- with no questions asked. Also, don’t forget that you can save some cash by entering a cleanmymac coupon code which will cut your prices by up to 50%! Coupon is available very beginning of the post just reveal and redeem the code and enjoy the discount. So what are you waiting for use our special cleanmymac discount coupon to get instant discount. They offer you up to 3 methods of reaching out to them (and unlike other companies, all these methods do work). These methods include- phone calling, emailing, and live chat. I’ve personally used all these methods and I can offer you some good advice…if you’ve an urgent/serious issue with your app, give them a phone call (+1 (877) 562-2729, toll-free) for professional help…and if you can’t call, consider your second option as the live chat (available during the US working hours). For general requests and queries, a mail ([email protected], they’ll reply faster if you send on working hours) will do. Above all, they offer you comprehensive text instructions and documentation that give you an easy time using the app to perform different tasks. Running CleanMyMac on my Mac made me realize that Macs actually have more junk files that we think. Running the Smart Cleanup alone discovered 4Gigabytes of junk files that have been lying on my Mac for all that time I’ve been using it. And cleaning them really made a difference in my disk space and overall computer speed. But the real difference came in when I tried all the other cleaning and utility features. I can comfortably tell you that CleanMyMac X is worth your time, money and Mac. It’ll do the job. Plus it’s quite affordable, so you’ve no excuses to make.